Not part of our site. 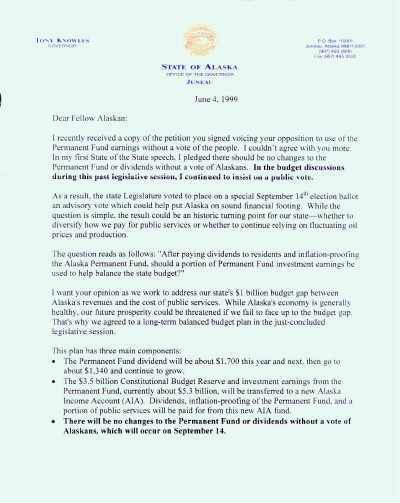 On June 4th 1999, Governor Tony Knowles spent state funds to send out this letter to lobby against your opinion. We know how he wants you to vote and where his plan will take Alaska's PFD. Here is his letter and transcript to it. I recently received a copy of the petition you signed voicing your opposition to use of the Permanent Fund earnings without a vote of the people. I couldn't agree with you more. In my first State of the State speech, I pledged there should be no changes to the Permanent Fund or dividends without a vote of Alaskans. In the budget discussions during this past iegisiaiive session, I continued to insist on a public vote. As a result, the state Legislature voted to place on a special September 14" election ballot an advisory vote which could help put Alaska on sound financial footing. While the question is simple, the result could be an historic turning point for our state -- whether to diversify how we pay for public services or whether to continue relying on fluctuating oil prices and production. 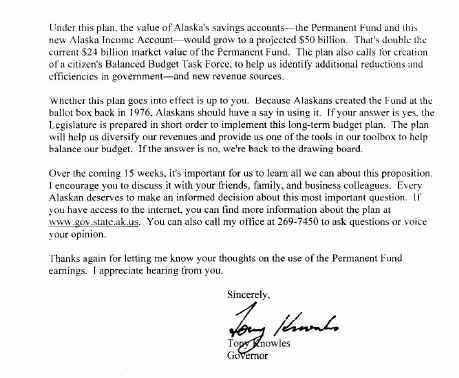 The question reads as follows: "After paying dividends to residents and inflation-proofing the Alaska Permanent Fund, should a portion of Permanent Fund investment earnings be used to help balance the state budget?" I want your opinion as we work to address our state's $1 billion budget gap between Alaska's revenues and the cost of public services. While Alaska's economy is generally healthy, our future prosperity could be threatened if we fail to face up to the budget gap. That's why we agreed to a long-term balanced budget plan in the just-concluded legislative session. * The Permanent Fund dividend will be about $1,700 this year and next, then go to about $1,340 and continue to grow. 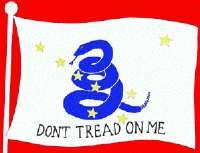 * The $3.5 billion Constitutional Budget Reserve and investment earnings from the Permanent Fund, currently about $5.3 billion, will be transferred to a new Alaska Income Account (AIA). Dividends, inflation-proofing of the Permanent Fund, and a portion of public services will be paid for from this new AIA fund. *There will be no changes to the Permanent Fund or dividends without a vote of Alaskans, which will occur on September 14. Under this plan, the value of Alaska's savings accounts -- the Permanent Fund and this net Alaska Income Account -- would grow to a projected $50 billion. I hat's double the current $24 billion market value of the Permanent Fund. The plan also calls for creation of a citizen's Balanced Budget Task Force, to help us identify additional reductions and efficiencies in government -- and new revenue sources. Whether this plan goes into effect is up to you. Because Alaskans created the Fund at the ballot box back in 1976, Alaskans should have a say in using it. If your answer is yes. the Legislature is prepared in short order to implement this long-term budget plan. The plan will help us diversify our revenues and provide us one of the tools in our toolbox to help balance our budget. If the answer is no, we're back to the drawing board. Over the coming 15 weeks, it's important for us to learn all we can about this proposition. I encourage you to discuss it with your friends, family, and business colleagues. Every Alaskan deserves to make an informed decision about this most important question. If you have access to the internet, you can find more information about the plan at www.gov.state.ak.us. You can also call my office at 269-7450 to ask questions or voice your opinion. earnings. I appreciate hearing from you.